Welcome to Solar Deal Club! Scouting out the best deals on solar installations, panels & other solar products and accessories. We are thrilled to announce our next Facebook giveaway, sponsored by SOLVAO! 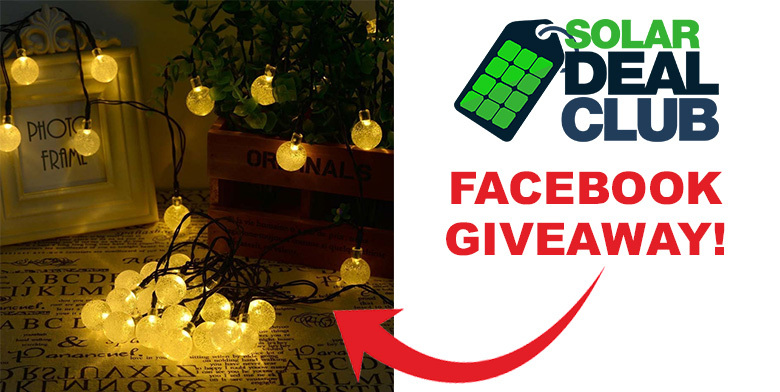 You can win these awesome 30 LED solar string lights by entering to win on our Facebook page. Visit our Facebook page now to enter! ONE DAY FLASH SALE! 16 LED Solar Motion Light for 72% Off MSRP! To thank all Solar Deal Club contest participants from their first giveaway, SOLVAO is taking an additional 30% off the already discounted sale price of their SL160 solar motion sensor light! You pay just $12.60! That’s 72% off the original MSRP! Visit our post on Facebook comment “flash” on this post to get the coupon code. Be sure to grab this deal today! http://www.solardealclub.com/wp-content/uploads/2017/10/solar-deal-club-sl160-discount.jpg 392 780 Solar Deal Club Team http://www.solardealclub.com/wp-content/uploads/2017/09/solar-deal-club-logo3.png Solar Deal Club Team2017-10-28 15:43:242017-10-28 15:43:24ONE DAY FLASH SALE! 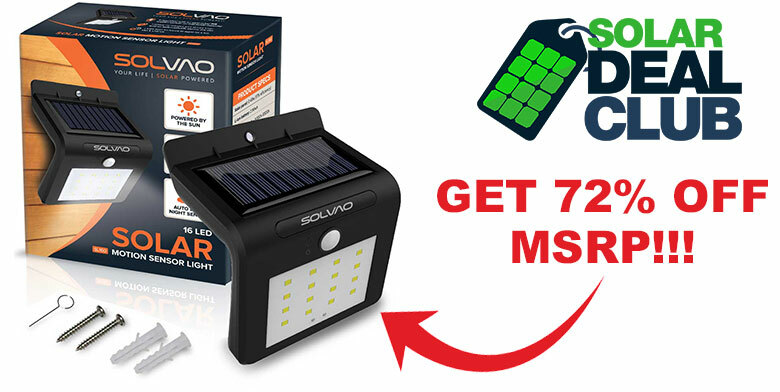 16 LED Solar Motion Light for 72% Off MSRP! We are thrilled to announce our first Facebook giveaway, sponsored by SOLVAO! You can win this awesome ultra bright 16 LED solar motion sensor light by entering to win on our Facebook page. Join The Club to get notification of our first deal sent directly to your email, or follow us on Facebook, Twitter, or Instagram for social media alerts!